My Version of Paradise . . I am reeling from a few days in my version of paradise! I have to say, if there is a favorite activity on vacation, it’s visiting private or public gardens in the city or place in which I find myself. I have visited a lot of famous ones, and lesser known ones which I discovered by accident, including those on the road to Hana on Maui. There is even one called the Garden of Eden on that slightly treacherous descent, which made for a suitable and beautiful pause in my action-packed drive to Hana. No matter where I go, I look for gardens or plant centers to buy a suitable plant souvenir. And those with whom I frequently travel know this is my passion! So recently, as I visited my sibling in Los Angeles, I was treated to two separate trips to the Huntington in San Marino, near Pasadena. It’s one of my favorite public gardens on the planet, covering over 150 acres of themed gardens. The grounds of the once private estate have been routinely filmed in movies, commercials and used for various concerts and gatherings. You’ll recognize numerous locations from decades of filming! And I personally have taken thousands of photos of plants, animals, nature, and the artwork which is housed on the property in various buildings in the numerous visits I have made to the Huntington over several decades now! The first visit of my recent travels fell upon the day set aside for free admission. We had no idea we had timed our visit accordingly. The crowds and the heat made for a rather brief visit that day, as both considerations made our visit more complicated. 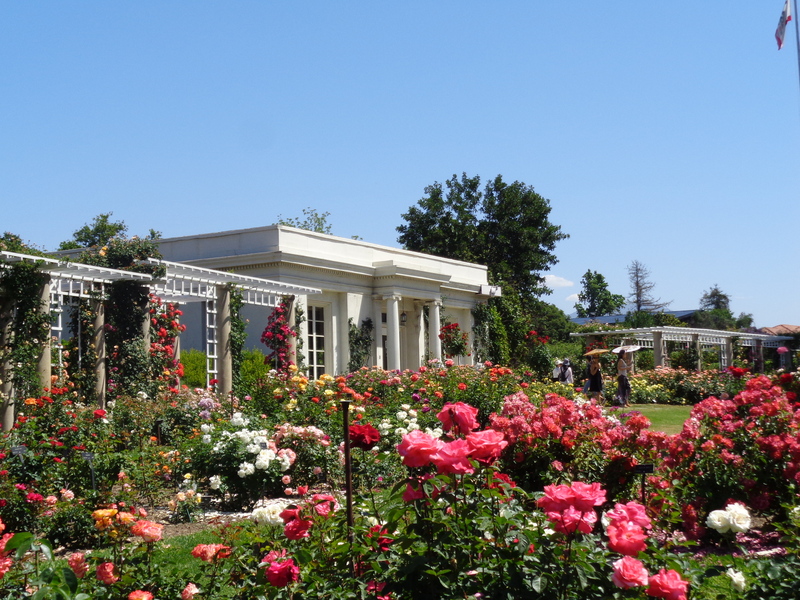 We did our best to enjoy it though, and lingered mostly in the Rose Garden, as the roses were at the height of their blooming season seemingly that very day! It was lovely to behold the hundreds of varieties, new and old, in full and glorious bloom! I took as many pictures as I could around the crowds wandering along the rows of beautiful blossoms. Unfortunately, we all ran out of steam early on in the day because of the heat and humidity which prevailed. So we left and promised a return if possible on the weekend, even though rain and the significantly cooler weather was forecast. After all, this day’s visit hadn’t cost us a thing! By Sunday the weather had turned enough to allow us to revisit the Huntington again. This day was about 30 degrees cooler and rain threatened from the dark clouds hovering nearby. Determined not to let the threat stop us, we walked around the much emptier garden pathways, taking in all we hadn’t been able to on the prior visit just a few days earlier. We were greeted by families of geese, protecting their young, and we reveled in the glorious lighting provided by the puffy clouds moving overhead. There was a gentleness which hadn’t been there just a few days prior, as the weather and the number of other visitors were less frenetic! I again took hundreds of photos, which is my normal behavior given so much perceivable beauty all around me! 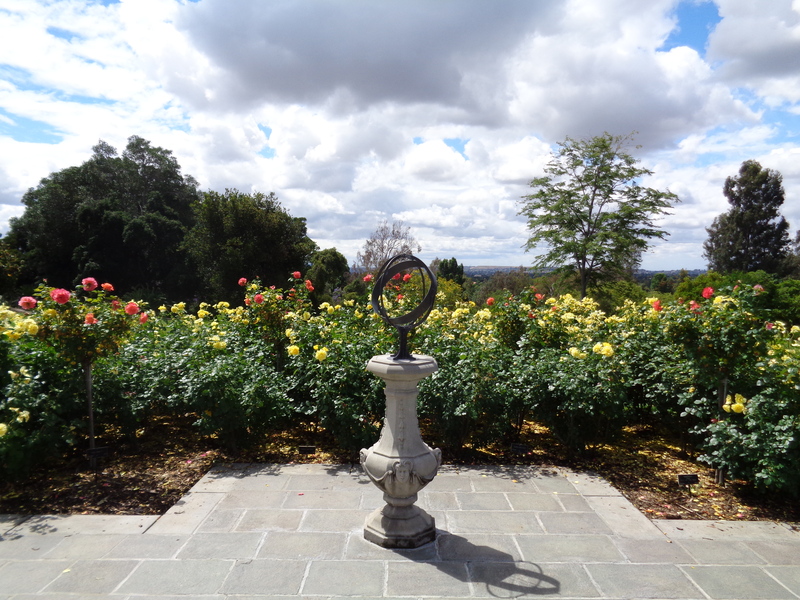 We visited the Rose Garden anew, although the heat from a few days earlier had taken some of their strength and beauty away. They were past their prime in many regards, but still lovely. The Huntington is so rich with beauty that no matter what is blooming and when you visit there is always something glorious to behold! And so I was in heaven for having had two visits in a long weekend visit to California. The final grandeur came with a day trip to Santa Barbara in between the Huntington visit days, on which I was able to buy a souvenir plant to bring back home! It’s an absolutely beautiful Bambino Bluey Bougainvillea, bursting with bluish-lavender bracts and bright green leaves. It’s a new cultivar and will make a great addition to the varieties I already have growing in my desert garden. And so, I happily accept the weather highs and lows, the plan “B” mentality we had to adopt and the explorational flexibility which came accordingly. Every day is different in a garden, every moment varies by what is blooming and what nature has to offer at that particular moment! And I love every single minute of it all!